Your papers and photos are collected (hopefully in some kind of order that is clear to you), and you are ready to take your next step. What will it be? This depends on several factors. You need to ask yourself, and perhaps your family, a few questions. First of all, what is your goal? This is actually the key question for the entire exercise, which will require a real time commitment. Why are you doing this? If you have very few relatives – or none, you may want to find some. It’s very exciting to discover new “people”, someone who is connected to you through your ancestors. An example is my third cousin in Pennsylvania, who connects me to an earlier historical time than the post-war DP story that I knew about from my parents. There was in fact a pre-war exodus of Lithuanians who left their country to make a better living working in the mines in Pennsylvania. To have actual cousins emerging from that era is fascinating. It means I am connected to more than just my parents, my sister, and their immediate families. I am part of a clan. Because of our background as children of DP’s, many of us may feel that we don’t have a concrete sense of place or history. I would like to follow the thread of belonging not just for myself, but for my children and their children. In our “later” years, it seems, we tend look for those threads and find meaning in them. Laying out the thread and weaving it together makes us feel part of a larger, more important, more meaningful tapestry. So as we delve into our family ties, we need to decide whether we want to set up a) a family tree, b) a family history, c) a network of living relatives, or maybe – all of the above. Probably the simplest approach is to start with the family tree. 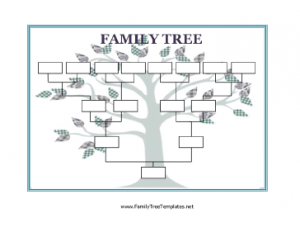 For a family tree alone, you can use a template (www.familytreetemplates.net), which is quite straightforward. Most allow entries for family member names, surnames, dates of birth and death, with a variety of layouts diagramatically showing relationships. These are not the same as genealogical programs. Programs provide more features. A Lithuanian-language website that I found (although it may be dated) http://www.polia.info/Genealogija/Programos.htm outlines a number of genealogical programs. The best seems to be http://www.myheritage.com/genealogy, which allows you to create a family tree on the internet, or download the Family Tree Builder http://www.myheritage.com/family-tree-builder. It is free, and supports Lithuanian language for names and surnames with our specific diacriticals (special signs on letters such as š, č, etc.). These would be important even for non-Lithuanian speakers, because correct diacriticals make the names authentic. Other features are error recognition (warnings when dates do not align, for example), and search tools. The family tree is a good starting point, because it does not require any more information than name/surname, relationship, date of birth and date of death. Simple. What if you don’t know these dates (or can’t remember them, or… can’t find the scrap you wrote them on)? Maybe there is a photo of grandfather’s headstone somewhere in the pile. Especially in the early post-war decades, they were often sent to us by relatives in Lithuania, together with the ghastly shots of everyone with sadder than usual faces standing around the open coffin of the deceased. If there is no photo of the headstone showing d.o.b. and d.o.d., contact the cemetery (e.g., St. John’s Lithuanian Cemetery, Mississauga). If there are no relatives you can contact in Lithuania to find out where someone is buried, a search may be possible through the municipality. For example, there is a listing of cemeteries in Kaunas and contact information for each. I was informed by one cemetery office there that queries must include the year of death, name and surname is not enough. Turning your attention to your genealogical tasks for just half an hour a day or even an hour every few days will bring you satisfying results – and there’s no exam!